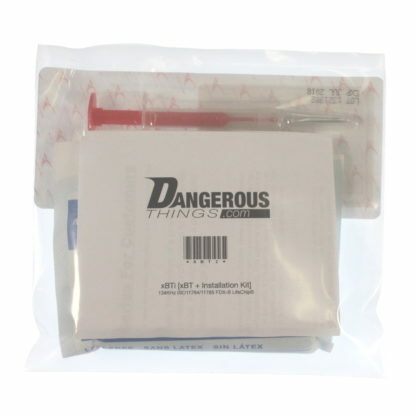 WARNING This kit definitely contains dangerous things. While the xBT (LifeChip) transponder device has undergone several quality checks during manufacture and has been put through a battery of tests with various private labs, it has not been tested or certified by any regulatory agency for implantation or use inside the human body. Use of this device is strictly at your own risk. 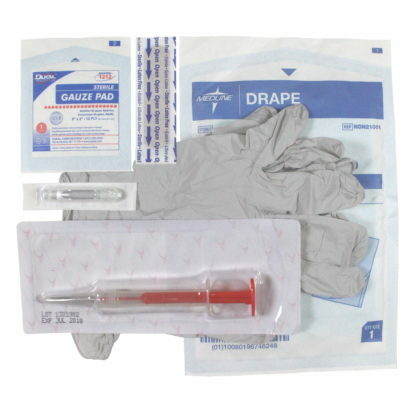 The xBT kit contains the xBT chip and all the sterile procedure materials required to perform installation. The xBT chip is made with 134kHz FDX-B compliant Bio-Thermo LifeChip, which is encased in biologically safe 2x12mm cylindrical borosilicate bioglass tube and shipped in a sterilized injection assembly. The xBT reports a simple ID number which works with any FDX-B reader, and can also transmit temperature sensor data to a compatible Bio-Thermo reader. How/where to install the xBT tag? Aftercare? What to expect? Typically, our x-series transponders are installed into the webbing between the metacarpal bones of the index finger and thumb, resting parallel to the index metacarpal. However, the xBT’s thermal sensor provides the most stable output when installed away from extremities and closer to the core of the body. 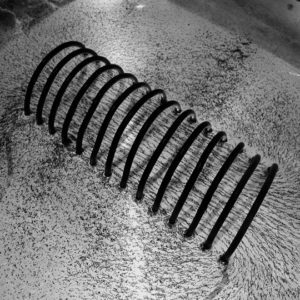 Temperature in the hands and arms can fluctuate rapidly with changes in surrounding ambient temperature, and are not ideal for recording stable thermal readings. The best installation location for the xBT tested so far has been in the skin near the arm pit, but not actually in the fold of the arm pit. 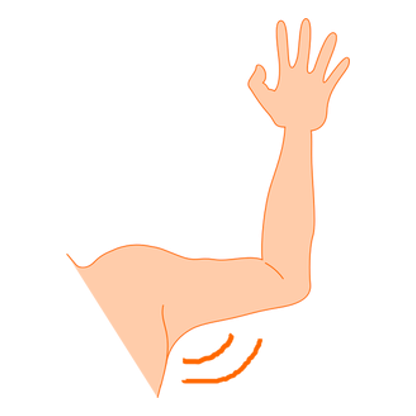 For example, the area on the inside of the upper arm which rests against your torso when your arm is down would work well. 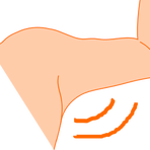 Similarly, the torso area just under the arm pit which is completely covered when the arm is down, is also an acceptable location. For aftercare information and what to expect, please read our X-Series FAQ page. How does BioBond anti-migration coating affect removal/replacement? 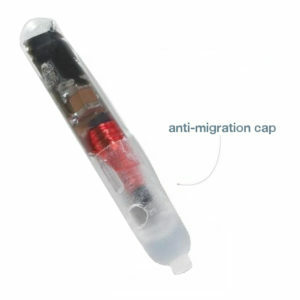 BioBond is a porous material that, when applied to the bioglass encasement of the chip, forms an “anti-migration cap” which promotes tissue growth throughout its porous structure. The goal is to secure the tag and stop it migrating by literally letting the body grow into it to hold the chip in place. The xBT was designed for use in animals by Destron Fearing. The reason why the BioBond coating is necessary has to do with animal (dogs, cats, horses, etc.) physiology, as well as the method and care taken during placement. Our other x-series products do not have this coating in order to facilitate easy removal or replacement. Once tissue has grown into the BioBond coating around the xBT tag, removal or replacement of the xBT will be extremely difficult, but not impossible.